This was Die Hard‘s to lose, wasn’t it? Still, nice to see so many of Bruce Willis’ movies get some votes. 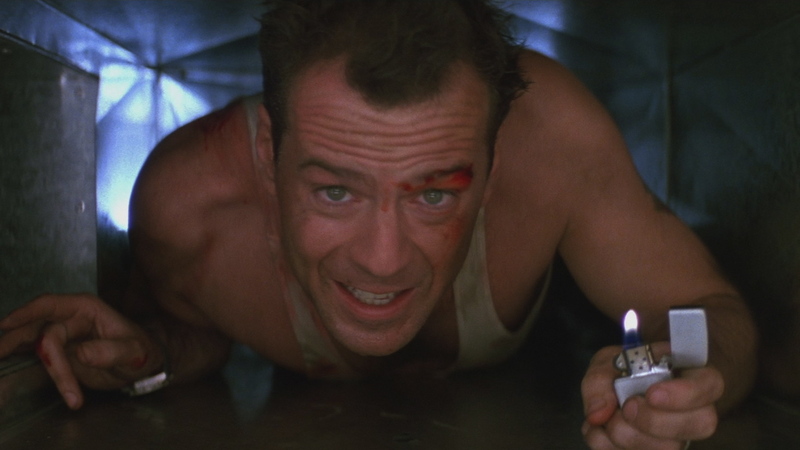 The man has had a great career, unnecessary Die Hard sequels be damned. This Week’s Poll: I’m sure many of you watched the Oscars last night (as did allegedly over one billion people worldwide), and I would like to hear your thoughts on the event. More specifically, what did you think of Seth MacFarlane’s performance as host? Just from doing my morning reading, it sounds like the reactions are pretty mixed. I will go on record in saying that he was a much better host than the dreadful duo of Anne Hathaway and James Franco from two years back, and it was refreshing to not have a “safe” bet like Billy Crystal from last year. What did you think? For some reason the poll thingy doesn’t let me vote, maybe it’s Family Guy’s fan 🙂 I’d give him F, it was really hard to sit through all of this and his cheap shots and tacky humor were terrible. Americans should learn from Brits – BAFTA is always funny yet classy. I gave him a B. He did fairly decently, but he was nothing spectacular. I wouldnt cry either way, whether or not he hosts next year. Yeah, same here. The opening monologue went on too long, and his jokes were hit-and-miss, but he wasn’t nearly as bad as he could have been. I just knew Die Hard would win, I need to rewatch that one, been awhile. There were a few moments during oscars that amused me(Captain Kirk,Flight as puppets, DDL cellphone joke) , but I agree with Sati was mostly low-brow humor. I guess that’s the norm now with Sasha Baron Cohen movies and Ted…I didn’t hate Seth MacFarlane, but didn’t love him either. Yeah, MacFarlane got louder laughs from me than the hosts from the last couple years, but there were just as many times where I groaned at the bad ones. Dude’s a pretty good singer though. Thinking about it, I wavered between a D and an F. Decided on the latter. Haha, damn. Not a fan of MacFarlane’s style of humor then? Neither his style nor his delivery. Bummer I missed this Bruce Willis poll! I don’t know why since I visited your blog a few times last week. Ah well, I’d have voted for Die Hard too, with his role in Unbreakable second, LOVE that movie. As for the new poll, well I gave Seth a C but more like a B minus. I had such a low expectation on him that I couldn’t be disappointed, ahah. He has a nice voice though, I have to give him that. Yeah, I think a C is a fair grade for Seth. I wasn’t expecting much either, but he had me really laughing from time to time. Yeah, some of the jokes were actually pretty funny. The Sound of Music one w/ Capt. Von Trapp had me in stitches!! Even Christopher Plummer looked amused. Seth was certainly a far better host than any of the ones we’ve had in recent years. I thought the show was pretty decent due to the several surprises and Life of Pi being the unlikely winner of the night next to Argo. I’m not surprised about Die Hard winning even though I voted for Pulp Fiction and 12 Monkeys. It shows that Bruce Willis, unlike other action types such as Arnold or Sylvester Stallone, has had the stamina and/or the vision to pick the right projects to sustain his career over time. I had Life of Pi pegged for a couple awards, but Lee winning Best Director was a nice surprise. Good point about Willis. He was able to diversify his career enough to keep going, and last year seemed to be one of his most fruitful yet.